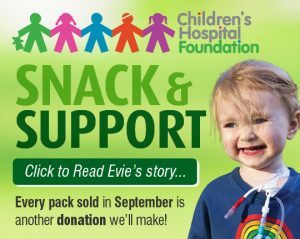 During September, Earth’s Bounty will be supporting sick kids, like 13 year old Jhett, by donating five cents from every pack sold to The Children’s Hospital Foundation. The Children’s Hospital Foundation helps sick kids today and tomorrow by funding life-saving medical research, investing in vital new equipment, and providing comfort, entertainment, support and care for children and their families. Their incredible volunteers are there to support children, like Jhett, while in hospital, helping them to laugh and smile, get better and go home with their families. By purchasing an Earth’s Bounty product, you’re making a donation that will help to fund research to achieve faster diagnoses, better treatments and ultimately cures for some of the most devastating childhood illnesses and injuries. We thank Jhett and his family for sharing their story with us. Jhett was born premature. At just six weeks old, Jhett started experiencing seizures and by age one, he was diagnosed with epilepsy. Following his second birthday, Jhett’s family received the news that he has autism spectrum disorder. At three years old, Jhett was rushed to hospital following a grand mal cluster of seizures, where he underwent a series of tests. The diagnosis was cerebral palsy. Jhett had a feeding tube inserted and depended on this for his nutrition, but by age four, Jhett’s health declined again and he spent the next 11 months in hospital. When Jhett finally returned home, cared for full time by his Mum, he continued to be fed by IV for two more years. As Jhett grew older he struggled with his learning, eating and his health continued to decline. His Mum decided to start Jhett on an organic diet removing all products containing the “nasties” from his diet and Jhett’s concentration and behaviour improved in leaps and bounds. Today, Jhett still needs supplemented tube feeding but he eats orally, enjoys learning and his speech is improving all the time. His improved nutrition has helped Jhett to feel good inside and out and his personality shines through. 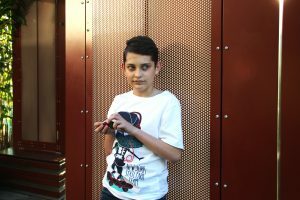 Full of life and love, Jhett is very well known within the Lady Cilento Children’s Hospital and the support he has received from the Children’s Hospital Foundation during his stays, has helped make Jhett the fun loving, capable and stronger young man he is today. Find your nearest Earth’s Bounty Stockist.